Carle Vanloo (1705-1765) was born in Nice but rapidly joined his elder brother in Italy. In Rome, he was first trained by the painter Benedetto Lutti (1666-1724) and the sculptor Pierre Legros le jeune (1666-1719). Back in Paris in 1719, he studied at the Académie Royale, where he won first prize for drawing in 1723. He subsequently was awarded the Prix de Rome and spent several years in this city. Upon his return to Paris, he enjoyed a great success and produced paintings for the court and the Parisian high society. He was the friend and the main rival of François Boucher (1703-1770) and trained many important artists of the following generation such as Jean-Honoré Fragonard (1732-1806), Gabriel-François Doyen (1726-1806), Bernard Lépicié (1698-1755) and Louis Lagrenée (1725-1805). This painting belongs to a set of four paintings illustrating four allegories embodied by children (Music, Architecture, Sculpture and Painting). The present painting shows the Allegory of Music. Carle Vanloo's original painting was conceived as a decorative over door panel for the Salon de Compagnie of Madame de Pompadour in her castle at Bellevue. It is a good example of fashionable French decorative art of the mid-18th century, which favoured the depiction of mischievous chidlren's play. Three children clustered around a harpsichord; one plays and the others listen. John Jones (1800-1882) was first in business as a tailor and army clothier in London 1825, and opened a branch in Dublin 1840. Often visited Ireland, travelled to Europe and particularly France. He retired in 1850, but retained an interest in his firm. Lived quietly at 95 Piccadilly from 1865 to his death in January 1882. After the Marquess of Hertford and his son Sir Richard Wallace, Jones was the principal collector in Britain of French 18th century fine and decorative arts. Jones bequeathed an important collection of French 18th-century furniture and porcelain to the V&A, and among the British watercolours and oil paintings he bequeathed to the V&A are subjects which reflect his interest in France. 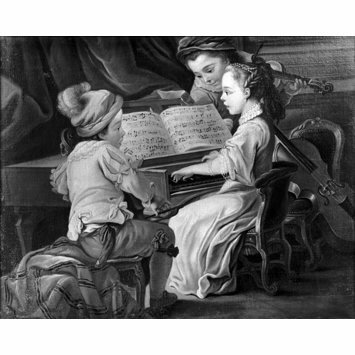 Historical significance: This painting is one of the many copies after the Allegory of Music currently housed in the Palace of the Legion of Honor, Fine Arts Museum of California (1950.12). It is part of a set of four paintings illustrating allegories of the four arts: Painting, Sculpture, Architecture and Music. The V&A owns a replica of each one (see 550-1882, 552-1882, 553-1882). 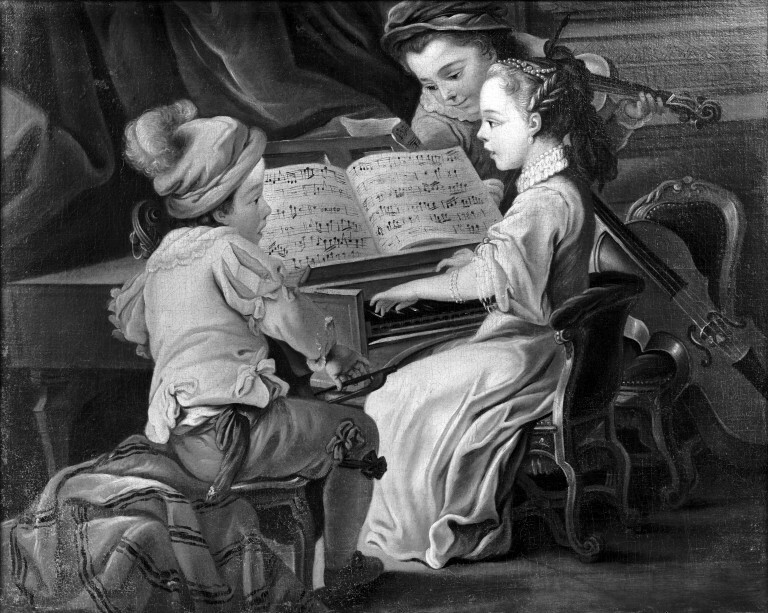 This Allegory of Music shows three small children clustered around a harpsichord; one plays and the others listen. The original set was conceived as over door panels for Madame de Pompadour's 'Salon de Compagnie' in her castle at Bellevue and were presented at the Paris Salon in 1753. They were extensively copied in the 19th century in different formats and were engraved, not in reverse, by E. Fessard as early as 1756. A set of four paintings (perhaps the originals but doubtful) was on the London art market by 1853 (sale Christie & Manson, 27-28 May 1853, lots 190-193). The V&A paintings could have been therefore executed either after the engraving or another painting and may be dated from late 18th century to mid 19th century. This painting is a good example of Vanloo's decorative paintings, which are characterised by lingering Rococo mannerisms but also anticipate a re-orientation of French art towards the new style. Allegorical decorative panels were then fashionable and often involved children and naked putti such as in the art of Boucher who was Vanloo's main rival. Decorative paintings originated in the Antiquity with frescoes, a technique that was reintroduced and developed in the late 13th century and the 14th century particularly in the work of the Isaac master, Giotto and his followers and perfected during the Italian Renaissance. In Florence and Venice, these compositions were also often executed on panels (spalliere) or canvases and then inserted into architectural elements directly carved or applied on the walls. This trend was exported to France and became particularly fashionable during the 17th and the 18th century under the patronage of enlightened kings such as Louis III and Louis XIV, followed by the Parisian high society. The Rococo period for instance favoured decorative scheme peopled by mischievous figures while the succeeding Neo-classical movement developed furnished interiors that combined Greek and Roman decorative and architectural sources in such examples as James Stuart's Painted Room in Spencer House, London (1759) and sought-after designs by Robert Adam which were circulating thanks to the publication of Works in Architecture of Robert and James Adam (London, 1773-9). B. Long, Catalogue of the Jones Collection, London, 1923, p. 43 f.
Carle Vanloo, premier peintre du roi exh. cat. Nice, Musée Chéret, 1977, p. 71.